20 SMT Magazine • February 2015 The website is the home of many iconic tin whisker photographs, one of which is shown in Figure 1. This website is frequently and justifi- ably referenced when the topic of the risk of tin whiskers is mentioned. But what is the true risk of tin whiskers in today's products, and what are the mitigation strategies and their effective- ness in handling this threat? What are Tin Whiskers? 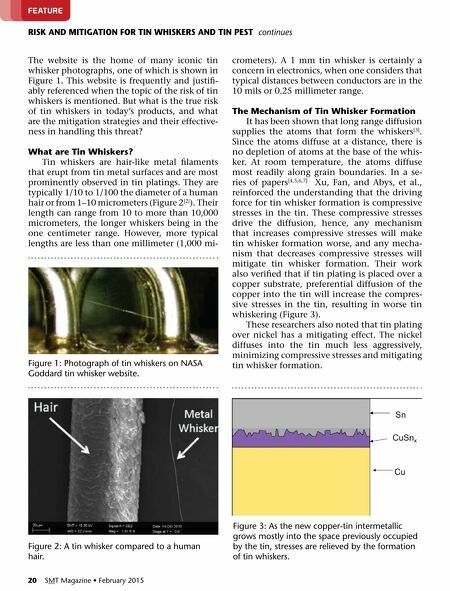 Tin whiskers are hair-like metal filaments that erupt from tin metal surfaces and are most prominently observed in tin platings. They are typically 1/10 to 1/100 the diameter of a human hair or from 1–10 micrometers (Figure 2  ). Their length can range from 10 to more than 10,000 micrometers, the longer whiskers being in the one centimeter range. However, more typical lengths are less than one millimeter (1,000 mi- rISK aNd MITIGaTION FOr TIN WHISKerS aNd TIN PeST continues Feature crometers). A 1 mm tin whisker is certainly a concern in electronics, when one considers that typical distances between conductors are in the 10 mils or 0.25 millimeter range. The Mechanism of Tin Whisker Formation It has been shown that long range diffusion supplies the atoms that form the whiskers  . Since the atoms diffuse at a distance, there is no depletion of atoms at the base of the whis- ker. At room temperature, the atoms diffuse most readily along grain boundaries. In a se- ries of papers [4,5,6,7] Xu, Fan, and Abys, et al., reinforced the understanding that the driving force for tin whisker formation is compressive stresses in the tin. These compressive stresses drive the diffusion, hence, any mechanism that increases compressive stresses will make tin whisker formation worse, and any mecha - nism that decreases compressive stresses will mitigate tin whisker formation. Their work also verified that if tin plating is placed over a copper substrate, preferential diffusion of the copper into the tin will increase the compres- sive stresses in the tin, resulting in worse tin whiskering (Figure 3). These researchers also noted that tin plating over nickel has a mitigating effect. The nickel diffuses into the tin much less aggressively, minimizing compressive stresses and mitigating tin whisker formation. Figure 3: as the new copper-tin intermetallic grows mostly into the space previously occupied by the tin, stresses are relieved by the formation of tin whiskers. Figure 2: a tin whisker compared to a human hair. 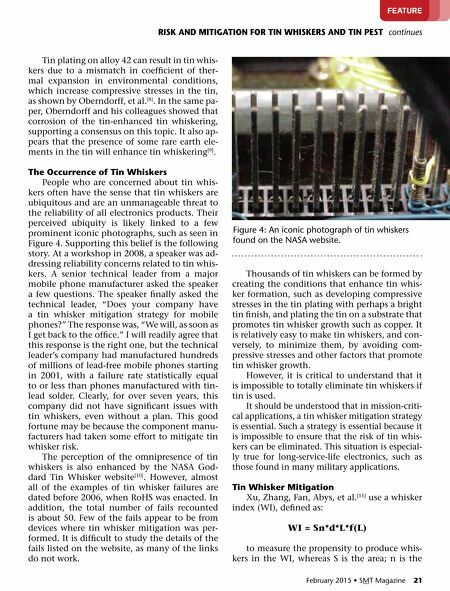 Figure 1: photograph of tin whiskers on nASA Goddard tin whisker website. Column — New Year Outlook: What Can We Expect in 2015?